The Allies continued fighting in North Africa, where they now faced General Erwin Rommel’s Afrika Korps, and the war in the Balkans intensified with Germany conquering Yugoslavia and Greece. In the Mediterranean and Atlantic, the Allies fought a bitter campaign to defend their vital sea-lanes. The Axis powers’ declarations of war on the Soviet Union and the United States proved a critical turning point. Germany undertook a bitter campaign on the Eastern Front, while Japan had to safeguard its conquests in the Pacific. The Axis powers had to face the might of the Soviet Union and the United States. President Franklin D. Roosevelt announces a program to produce 200 freighters, called ‘Liberty’ ships, to support the Allied Atlantic convoys. General Sir Archibald Wavell’s Middle East Force, renamed XIII Corps, with air and naval support, resumes its offensive into Cyrenaica. In Australia’s first land action of the war, the Australian 6th Division leads the attack to capture Bardia, just across Libya’s border with Egypt, on the 15th. Some 70,000 Italians, plus large amounts of equipment, are captured. After the British 7th Armored Brigade encircles Tobruk, the Australian 6th Division leads the assault against the Italian defenders of the port, who eventually capitulate on the 22nd. Some 30,000 Italians, as well as port facilities, and vital supplies of fuel, food, and water, are seized. Major General Sir Richard O’Connor immediately sends forces farther west along the coast to capture the port of Benghazi. British forces in the Sudan, led by General William Platt, begin attacking Italian forces, heralding the start of General Sir Archibald Wavell’s campaign against Italian East Africa. 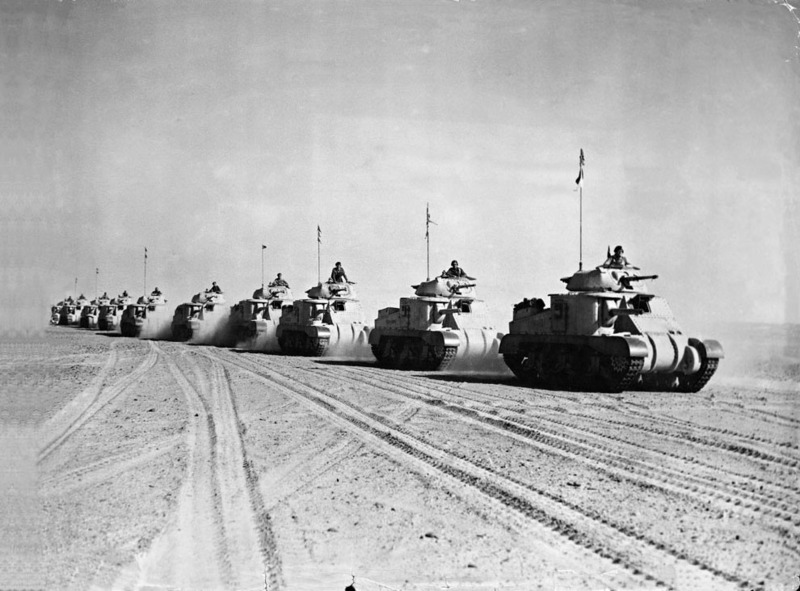 The British 4th Armored Brigade engages Italian tanks near Mechili. The Italian forces in Libya are now divided, with units inland positioned around Mechili, and other forces on the coast around Derna. They do not support each other and both face encirclement. British forces based in Kenya led by General Sir Alan Cunningham begin attacking the Italian colony’s garrison in the next stage of their campaign against Italian East Africa. A significant advance in Anglo-US cooperation begins with staff talks in Washington. A decision, code-named ABC1, is eventually made that places Germany’s defeat as the principal Allied aim in the event of the US declaring war. These talks lead to a US mission in March to visit potential sites for military bases in Britain.